The director of Human Rights in Judea and Samaria receives award from Jewish National Staff. The Jewish National Staff gave a certificate of appreciation Friday to Orit Strook of Hevron, Director of the Human Rights in Judea and Samaria organization. The Jewish National Staff organized a tour of Hevron for about 400 people from greater Tel Aviv and other parts of the country, led by Major General (res.) Uzi Dayan. The members of the group took the opportunity to present the award to Strook, who is also Head of the Legal and Political Department of the Jewish Community of Hevron. 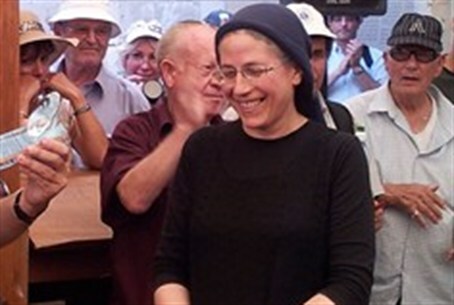 "Orit, mother of 11 children and a grandmother of grandchildren, received the certificate of appreciation for her large scale, tireless activity for solidifying the rights of Jews in Hevron and the Land of Israel." The Staff's "Diamond Decoration" was awarded to Strook by Lt. Col. (res.) Avi Yehezkeli.